As an example, let's form a C Minor 7th chord. A Minor 7th chord is made up of a Minor triad, and a Minor 7th interval. 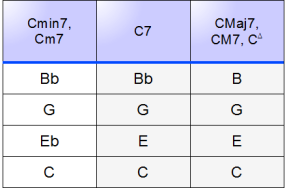 The name of the chord gives us the root, that is, C.
We know that a C minor triad is made up of C, Eb, and G.
The Minor 7th Interval above C is Bb. Therefore, the notes C, Eb, G, and Bb make up the C Minor 7th chord. Let us follow the same procedure again to form a F Minor 7th chord. We know that a F Minor triad is made up of F, Ab, and C.
Therefore, the notes F, Ab, C, and Bb make up the F Minor 7th chord. We now expand our chart to include the Minor 7th chord construction. Notice that both the Major 7th and Dominant 7th columns are shaded, being the most common forms of the 7th chord. Again, this shading also helps us to visually see the relationship between the different types of chords.